MJR staff members pose with the newest edition of the magazine. The new edition of Montana Journalism Review tracks Western journalists as national and global events push them past their comfort zones. From local coverage of refugee resettlement to an experiment in right-wing news immersion, the 2017 issue of MJR scrutinizes how news professionals are responding to growing distrust in the media and ongoing changes in the industry. Titled “Far From Comfort,” the magazine examines advocacy journalism, emerging business models and gender gaps in sports coverage and news management. “With the proliferation of fake news and echo chambers, we worked hard to find stories that advance the conversation and show the state of the media in the western United States,” Managing Editor Claire Chandler said. Work on the 46th edition began last spring, when Editor-in-Chief Henriette Lowisch and Executive Editor Keith Graham, both journalism professors, selected the student staff that puts together the annual magazine founded by J-School Dean Nathaniel Blumberg in 1958. Over the following seven months, student editors, writers, photographers and designers learned how to problem-solve and work together as they brainstormed story ideas and headlines, recruited contributors, sold ads and got the 68-page book ready for print. While Art Director Delaney Kutsal envisioned the magazine’s design elements, from color scheme to formatting, senior editors Diana Six, Katy Spence, Dakota Wharry and Bayley Butler handpicked stories and took them through three rounds of editing. Contributors to MJR 2017 include former Missoulian Editor Sherry Devlin and Wyofile reporter Dustin Bleizeffer as well as J-School alums Evan Frost, Tess Haas, Carli Krueger and Hunter Pauli. Current faculty, graduate and undergraduate students also wrote and photographed stories, including staff writer Maddie Vincent and staff photographer Olivia Vanni. In October, final drafts were sent off to Copy Chief Taylor Crews, who organized her team for the stringent fact-checking and copy-editing process. Designers got their hands on copy in early November and faced a quick two-week turnaround. 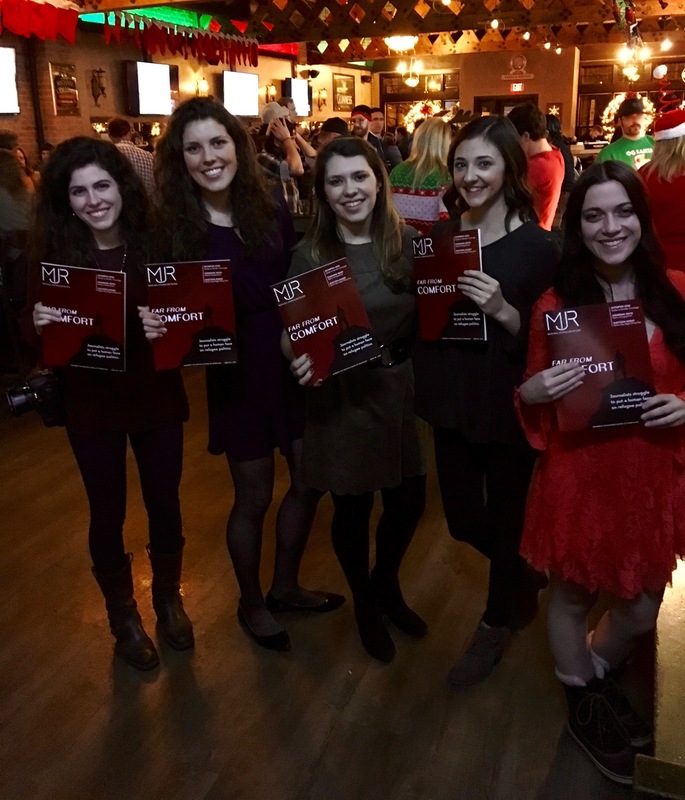 In addition to the print magazine released on Dec. 16, 2016, MJR published its stories on its website at mjr.jour.umt.edu, under the leadership of Web Editor Matt Roberts. It also produced Framing a Movement: The Media at Standing Rock, a web documentary orchestrated by Senior Editor Kathleen Stone and funded with the help of the J-School’s Blumberg Fund for Investigative Journalism and UM President Royce Engstrom. Montana Journalism Review is the product of a journalism capstone course offered each fall. The magazine is financed through ad sales and support from the School of Journalism. The print edition is sent out to 750 subscribers across Montana, the nation and the world. Seven journalism students face a bank of screens, and with only a few minutes to go before recording starts, the atmosphere is busy and tense. This is the control room of UM News, a weekly news segment staffed by senior broadcast journalism students. 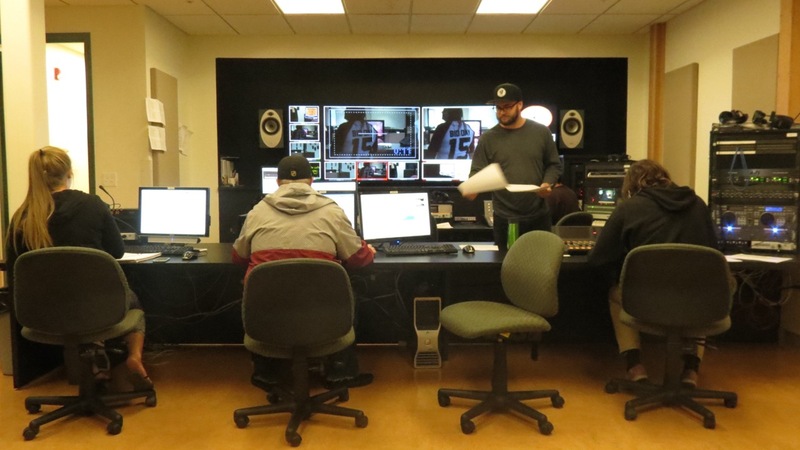 Though the students are producing their broadcast in the Don Oliver Television Studios on the first floor of the journalism building, the segment airs each week on KPAX-TV and ABC Montana. “Are we almost ready to go?” Sean Robb asks his colleagues, who are busy cueing instruments. Robb, who is from California and will graduate next spring, is working as a producer today. Other days he is chasing stories as a reporter, in front of the camera as an anchor, or behind it as a cameraman. “It’s really good experience to do something over and over each week,” Robb says, adding that the practice makes him more efficient at reporting and producing. The pressure to produce in UM News is intense, he says, in a way that reflects the working world of a broadcast journalist. Associate Professor Ray Ekness, a former broadcast journalist himself, agrees that the program simulates the pressures of the working world. Students do get the buffer of two dry runs before they record the broadcast that will air on television, which is a safety net for the learning students he said. The semester in UM News includes a broadcast filmed without dry runs as well. Silence descends on the control room as the team keys in the cameras. Today’s director is Joe Hodgson, a senior from Great Falls, Montana who spent his summer interning at Comcast Sports in San Francisco. “Go ahead and pan to the right ever so slightly,” he directs his cameraman, watching on the screens in front of him. On Friday, the students will meet with professionals from KPAX-TV and ABC Montana for a review of the week’s broadcast. They’ll learn the tricks of the trade and how to streamline their next show. “Go ahead and roll thunder, full sound!” Hodgson orders, and the broadcast is under way. When classes end each afternoon for Ariana Lake, age 21, her day as a budding broadcast journalist is only just beginning. Since the beginning of the semester, Ariana has been balancing a full course load at school with a 40 hour a week job as news anchor and producer at the television station KAJ, Channel 18. Leaving campus early-afternoon, Lake races to the studio each day to get her 5 o’clock broadcast ready. She broadcasts at 5:30 p.m. and again at 10 p.m. Mondays through Fridays. 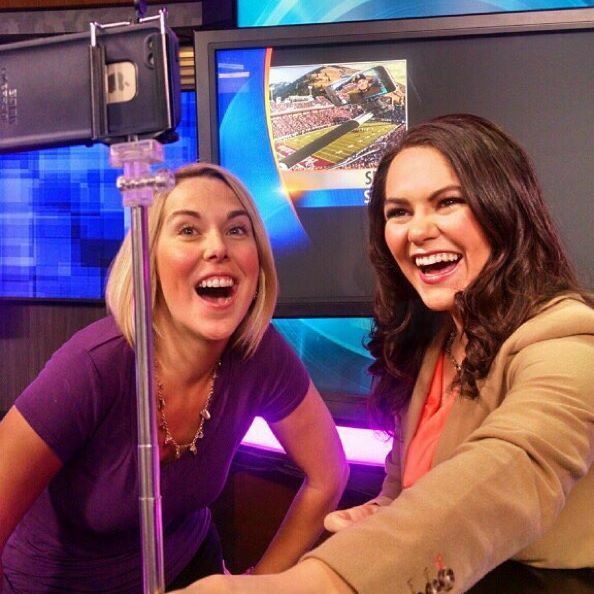 Chief Meteorologist Erin Yost (left) and Ariana Lake (right) on set before their 5:30 show on selfie sticks at Griz games. KAJ serves the Flathead Valley area, and the stories Lake produces are reported by two correspondents, both her senior in age. They pitch her the day’s stories in the morning, which Lake helps review via either email, text or phone call while she goes about her school day. Although her market is the Flathead, her broadcast is produced at the KPAX studio in Missoula. KPAX and KAJ are sister stations and CBS Affiliates. Lake was hired as a part time reporter for KPAX last year. When she saw the anchor and producer job open up in August, she wasn’t going to bother applying, certain she didn’t have enough experience. Then, after receiving some encouragement from a co-worker and her parents, she decided to go for it. She was hired within a few weeks. She says that getting in the 5 o’clock broadcast, which has to be taped by 4 p.m., is a challenge. Some days she reaches the studio at 1:45 p.m., leaving her less than three hours to meet her deadline. Still, it’s a challenge Lake says she welcomes: “If you’re passionate about what you’re doing it’s not that hard,” she said. After her second broadcast wraps around 10 p.m., Lake finally heads home, where she usually does around two hours of homework. To see what Ariana Lake’s been producing, you can follow her on twitter: @ariana_lake or check out her broadcasts online at KAJ’s website.